This week you will feel equally movement and stagnation. While things will want to move forward, you need to take time to stabilize your own sense of self, energy and strength. Embrace any movement that might happen and go with the flow, and take the weekend to heal and nurture yourself. June is about introspection, and allow some time to do that this week to accelerate any healing that needs to happen. June’s energy is guided by introspection and learning. You can expect not to take any big action, and are encouraged this month to continue to connect with your inner self and reflect on the lessons you’ve learned. You need some important realizations and time to process your experiences before you can take concrete action. Some pleasant surprises in the forms of connecting with others and taking part in events and celebrations will come up. Take advantage of these opportunities to be with others and have some fun, as it will lift your energy! Whatever you do, keep dreams and wishes high and use your imagination to give the universe your biggest desires. Don’t hold back when making wishes! When we reach July, we’ll be ready to take more action and feel invigorated, whether we take a trip, go to school, find a new job, or simply have a better understanding of who we are and what to do next with our lives. I am so thrilled to bring you a message from Archangel Cassiel for June. Archangel Cassiel is a very mysterious angel who has been in my energy field as of late, but who I did not know until the time I wrote this message. He is very esoteric, wise and gentle, and has come through for us at this moment in time. He has an extremely high vibration, and appeared to me as sky-blue and white light, constantly weaving in and out of every space. I saw how he surrounds planet Earth with love energy at a constant rate, and looks at every individual lovingly. He is known in ancient scripture for not interfering, but is rather a watcher, without any particular duties assigned to him, although he has been known as the ‘Angel of Tears’ due to his association with death. 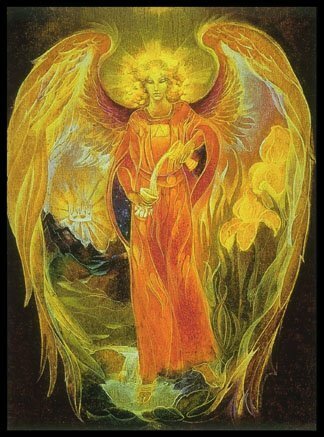 Archangel Cassiel, however, is not about death but rather about transition! He helps us restore balance to our lives, and has enormous love for humans and Earth. He helps you experience the love of God and will bring you closer to it, ultimately bringing you closer to your own love of self and Divine energy. He is often depicted as an old man, and I can understand why: his energy is very wise, and somewhat of a teacher. He will teach you under a Socratic method by asking you questions in answer to your own, and helped me realize some very altering truths about my own life today. June is a time for you to regroup and refocus. Cassiel explained that many are scattered and feeling like anything they do will collapse, simply because we are out of alignment with our true selves. This means we have been fixated on what we cannot have, or what we do not have the confidence to do, or what could hypothetically happen–and ultimately collapse–if we do something differently from what we are currently doing. Basically, we fall into an emotional and mental downward spiral! Therefore, take June to focus on our source of love and the types of activities, people and things that energize us, and we will be able to build our sense of self-confidence. Self-confidence, he explains, is vital for removal from ego fears. Take this month as a gift of time: time to review the past few months as a way to get in touch with what you want and don’t want, time to focus on who you are and the love you are, and time to realize that there’s no rush in uncovering inspiration. I am Archangel Cassiel, keeper of love to help you restore balance. This month you have a theme of review; to review what I see as tough times for you these past few months, and review these circumstances to better understand who you are and what you want. So many of you are seeking next steps to take, and I am here to tell you that there are no next steps if you are not in touch with your wants and needs. You may feel stuck because you simply don’t know where to go or what to do with yourselves. I want you to know that now is the time to focus on your self confidence. Now is the time to see yourself in your true form, as a being of love, as you are the pure love that God intended. By the end of this month, you will be ready to seek inspiration. This month it is time to realize there are no next steps, and that is okay to be in that space. You can be in this unknowingness as long as you need, for the knowingness is actually there, you simply cannot see it now because you have a different expectation of how your journey should play out. Let go of all expectations for yourself, and instead hope for something better, what you would call miraculous. Affirm that greater joy is in your life, and use this month of refocus and review to get in touch with you who are and what you desire. As humans, you are looking to make plans and make life altering decisions. This will come when you are ready; you will know you are ready when you know what you desire. I have long watched you and have sent you love. If you desire help and ease with this transition, call upon me and I will whisper into your ear thoughts of guidance and comfort. I do love your oceans, so whenever you are near any body of water, you will hear me more clearly. I can help you find the direction you need, as long as you have decided which direction you want to take. You will find this direction when you decide what you do–and do not–want to do. Remember that this is very different from what you want or not want to happen! It is about focusing on action to take, and not focusing on action taking you. If you want to think and feel clearly, do not speculate on possible occurrences of possible future events. Instead, focus on what you can most definitely do, and confusion about the future will dissipate as you focus on your present moment. This week continues to be a week of self care. The messages that come through this week are highly spiritual in the sense that we are guided to be aware of ENERGY. Everything is energy, and we are always sending and receiving energy. Its time to let go of old energy in the forms of feelings, thoughts and self confidence issues that no longer serve us. Be in touch with your intuition and let it guide you; it does not help to fall into anxiety and worry. Do not try to force things to happen; everything is in Divine Timing, so put positive expectations for you life out into the universe, and the universe will take care of you. This week is a week of new beginnings and also internal reflection and relaxation. Take advantage of Mercury Retrograde beginning by not forcing things to happen or forcing others to communicate; instead, focus on your own needs and the overall need to reflect and connect within yourself. Have faith in where you are at this point in time, and know that you are moving forward, even if you are moving forward into the unknown. Do what’s right for you this week! This week will be a heavy but also cleansing week as we go into a waning moon. The week starts off with a theme of empowerment; have confidence and be your authentic self as you navigate and explore potential changes. The middle of the week expect to be tired and emotional; work with this energy be seeing all your experiences with love and gratitude, and giving yourself loving care. The weekend is a time to rest and reflect as we move into a new moon and set new intentions. This week you can look forward to gifts of love and compassion from others, as well as the opportunity to give them back. Its important to keep your boundaries and not absorb others’ energies. The best thing you can do to navigate this week is trust yourself, your abilities, your intuition and have faith that things are working out as they need to work out. By the end of the week, some new things will come to light and you’ll have a clearer headspace to pay attention these new things. This month is all about things working into a more balanced energy. We have the opportunity to be more assertive and apply lessons from the past to our current situations. Let your emotions flow freely this month and infuse yourself with love; when you do this, you will find a lot of strength from within. By the end of the month, you’ll be assured you’ve made progress and be in a position to take more action as we move into June. 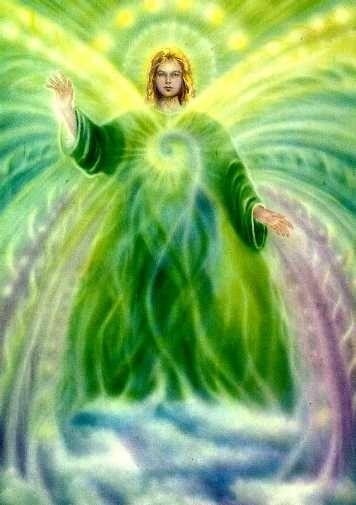 Archangel Raphael came through to provide us guidance for this month. Raphael is the archangel of healing, relationships and travel. He boasts a magnificent emerald green energy that can provide you healing on all levels. He is very sweet, very gentle and very firm. You can ask him for help with health concerns, relationship healing and manifestation, travel plans, and he has an affinity towards working with children and the elderly. May is a time for alignment. We’ve been experiencing new ideas, new circumstances, new opportunities and new relationships entering our current experience. The key this month is to let these new things begin to take root and align ourselves with these new energies while letting go of the outcome. Relationships are changing majorly. In some ways it will feel positive, in other it will seem negative. Remember that whatever your peception is, it is important to view your relationships as constanty healing. The color green is vital this month. Wear green, surround yourself with green plants, and focus on green emerald light shooting straight in to your heart center and inside and outside your body and soul. This green light is a gift from Raphael, and brings you the gift of Divine love. Your spirituality may take a hit this month, as you will become either discouraged or really take the plunge and be full of hope and faith. Remember whatever you choose to focus on will be magnified in varying results. There are many situations we are pushing against on both a personal and global scale. Rather than continue to push, it is in your best interest to pull back, recollect with yourself, and try taking a better, easier path that brings love to a situation. Unconditional love for your life is important now. Practice gratitude, which can be a very annoying new age concept, but focusing on your abundance rather than your lack will help heal your emotions. Have trust. We have been developing our ability to trust in things working out, and we must continue practicing this ability as things begin to take shape and mold before us. A lot of worry will come up this month because we are fixated on how life has worked out in the past, and we don’t know what will happen in the future. Heal your relationship with yourself by forgiving the past and letting go of the future outcome. Your relationship with yourself is at the forefront this month! If you worry about the end result, remember that there never is an end result in anything we do, including death. Things are constantly moving, morphing and developing, and it is important to remember that results are never permanent. BREATH is important here. Breath oxygen into every part of your body to bring yourself to the present moment. Feel the LIFE FORCE that is within you, and breath in LOVE when you begin to feel yourself spiraling into worry again. We will experience some extreme highs and lows as we align ourselves with our higher energies. This is part of the process of bringing ourselves into balanced alignment. Do not fear these energies; accept whatever you are feeling, thinking and experiencing, and bring yourself back to the present moment to center yourself again. It is a time for transformation this month. Create an inner circle of truth. Do you trust yourself right now? I can feel that you do not, as discouragement has invaded your energy field, like a stain you cannnot get rid of. This is a month of affirmation; affirm what you know to be true, and not what you doubt. Doubts are very high at this moment, and this puts a halt to manifestation. Your results will not be instantaneous. This month relationships will be moving forward, whether you are thinking aobut healing them, reparing them, forming new ones, redefining them or reconnecting with someone old or new. This is because you are more well defined, and are ready for a new partner, or comrade, to assist you in your journey of seeking joy. Emotions will be high this month, but let them be as they are; you are storing so many truthful feelings, and this has put your action to a halt. [When you store emotion without releasing it, you are unable to take action and forced into a standstill.] Ask for my emerald light to blast through your energy. Boundaries are important for you this month, because you will want to fall into old habits when it comes to your relationships. How much are you giving away, is the question to ask yourself, and why are you giving so much away? You deserve better! When you set high expectations for how you should be treated, the universe will answer in an equal matter, even if its not in the way you expect. We bring you so many possibilities that are out of your mental range simply because you find a way to halt your glorious imagination! That is the earthly way, but you can go beyond that. When we tell you to dream big, we are telling you to dream bigger and in a grand, non material sense where you receive endless amounts of loving energy in all forms, not just in possessions or events. Be open this month to receiving good, and good shall be delivered unto you. I will wrap you in my loving wings, and I ask that you do the same. View all situations in love and compassion, and ask that my emerald green light be brought to the situation. I am an angel who helps create the perfect situation for you at any given moment. Remember you always have choices, and you can always make these choices in any given moment. You always have multiple paths before you, and it is up to you which path you choose. Remember only when making a choice, you affirm that choice, rather than worrying about it. We see many make a choice, and then worry about the result of that choice. When you do this, that choice indeed becomes worrisome and you find yourself in the midst of a difficult situation. Affirm your choice, and know that at any moment at any time after that choice, you have many other different choices you can make. There is always space for adjustment. I love you infinitely my darlings.